After taking a break last year, the Whatyouwill festival devoted to improvised and experimental music in the Midwest returns this weekend for its 7th installment. 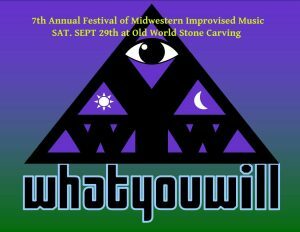 While Saturday is the focal point of the schedule, Whatyouwill 7 offers performances (and camping) over 3 days, Friday, September 28th through Sunday, September 30th, at its traditional location, Old World Stone Carving, located at 4820 Beard Rd, Sunbury, Ohio 43074. Promoter and organizer Gerard Cox has scheduled a wide array of talented musicians performing a variety of styles “that includes everything from progressive modern jazz to electronic music to free jazz” on two stages. Cox was kind enough to provide few thoughts on this year’s festival, including featured artist Dave Stone, and the full lineup. Keep reading to learn more from Cox, and visit the Facebook event page for further details and updates in case of severe weather. Gerard Cox: “The main addition this year is that we’ve added a listening room space inside the house. There were a lot of requests to do solo and duo sets and they deserve a more intimate listening environment. This is the first Whatyouwill since a hiatus in 2017 and we’ve really tried to refresh the program. While there are familiar names and some overlap, we’ve tried to give it a slightly different feel. The listening room is actually key because we’d really like for Whatyouwill to become more of a wanderer’s festival. Instead of just parking it in a seat in front of a stage, for festival-goers to be able to walk around and stumble into very cool things. 8 pm- Winchester Howse: Dale Johnson- piano, vox, with Gerard Cox- drums. 1 pm- Stan Smith- guitar, w/bass and drums TBA. 2 pm- L.A. Jenkins- electric guitar, and Phil Maneri- upright bass. 3 pm- Kurt Prisbe (Detroit)- drums, with Mario Bosca- bass, Owen Hopper- guitar, and special guests TBA. 4 pm- Volenik / Abdur-Razzaq / Hallahan / Clayton (Akron + Columbus). Don Volenik- trumpet, Hasan Abdur-Razzaq- saxophones, Ed Hallahan- bass, Rasuul Rollin Clayton- drums. 7 pm- Drake and Henry. (Cleveland) Bbob Drake- electronics + Alex Henry. 10 pm- Kline-Buckley Duo (Cincinnati). Josh Kline- tenor saxophone, Tom Buckley- drums. 3:30 pm- Tom Orange- saxophone with percussion loops. 4:30 pm- Squid Thrasher (Gerard Cox solo piano/percussion) a blindfolded set with guests who are a mystery to the player. 6:30 pm- Andrew Kovaleski / Owen Hopper. Solo saxophone (Kovaleski), Solo guitar (Hopper) and duo improvisations. Solo and ensemble sets starting at noon by Dave Stone (St. Louis), JayVe Montgomery (Nashville), and Ritwik Banerji (Cincinnati).